Exfoliation of the skin is essential in alleviating the dull and aged appearance that dead, un-exfoliated skin portrays. One of the most effective methods of exfoliation is to use alpha-hydroxy acids (AHA), which will help to expose fresh and radiant new skin! 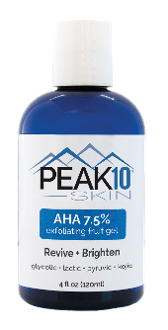 AHA 7.5% exfoliating fruit gel from PEAK 10 SKIN® is an exfoliating masterpiece that uses 3 of the most effective and natural alpha-hydroxy acids along with Kojic Acid to deliver a superior exfoliation experience, in a soothing and skin nourishing gel. Glycolic, Pyruvic and Lactic acids all contribute to this deep penetrating and fast acting formula. This powerful formula removes dead skin and revives the complexion in a delicate and calculated manner. In addition, Kojic Acid helps diminishes unwanted surface spots by reducing discoloration, leaving your skin feeling smooth and with a more even skin tone. Glycolic: Found in sugarcane, grapes and other fruits. It has the smallest molecule size of these 3 acids. Lactic: Found in sour milk and in molasses, due to partial conversion of sugars in apples and other fruits. Aids in exfoliation and softening of the skin. Pyruvic: Found in cane sugar juice. Excellent for treating problematic skin and has remarkable dead skin removing abilities. Kojic: A natural by-product in the fermenting process of malting rice and is a mild pigment inhibitor. It helps to brighten the skin by preventing the activity of tyrosinase, an essential enzyme for the synthesis of Melanin. Ingredients: Purified Water (Aqua), Glycolic Acid, Kojic Acid, Xanthan Gum, Lactic Acid, Pyruvic Acid.